For the very last in our All About Animal series, this festive month we are going to explore the horses that appear in the Seven Stories Collection. After you have read this post, why not click on the tab at the bottom to bring up all the other posts from this year long series. Just a tease - next year we will be exploring the terrific territory of transport! We hold material for some very famous literary horses, as you will see below when we take a look at an item from the archive, an artwork, and a book from the store. One of the best selling books of all time, and arguably the most well known book told from the perspective of a horse, Black Beauty was originally written, not as a children's book, but as a treatise on the need for better treatment of horses in Victorian England. It was the author, Anna Sewell's only book, and she died before knowing quite how popular the book would become. The illustrations for the very first Puffin edition, chosen by editor Eleanor Graham and published in 1954, were created by Charlotte Hough. The two black and white, pen and ink line drawings shown in the image above would have been used by the printer to reproduce the black lines for the cover of the book. The colour elements of the cover would have been created separately, using the colour sketch, also shown in the images alternating above. The different elements would have then been merged together in the final printing. The collection holds the complete suite of finished artwork, the cover, as shown above, as well as 18 black and white internal illustrations. The rest of the Charlotte Hough Collection consists of original artwork for 13 published titles for children, including complete suites of illustrations for the Puffin edition of Five Proud Riders, written by Ann Stafford. The collection also includes a hand-made dummy for an apparently unpublished picture book. The whole collection was donated in 2009, by two of Hough's children, Alexandra Hough and the novelist Deborah Moggach, following Hough's passing in 2008. Following on from this month’s featured illustrations for Anna Sewell’s Black Beauty, this month’s printed book is Black Beauty’s Family, written by Josephine, Diana and Christine Pullein-Thompson. This book was published in 1978 and is the second of three volumes of historical stories by the most famous ‘pony story’ writing dynasty of all time, the Pullein-Thompson family, which follow ‘in the hoofprints’ of Black Beauty. Told from the horse's point of view, these stories tell of the lives of a number of Black Beauty's relatives. This particular volume includes 3 short stories, one by each of the sisters: Nightshade by Josephine, Black Romany by Diana, and Blossom by Christine Pullein-Thompson. 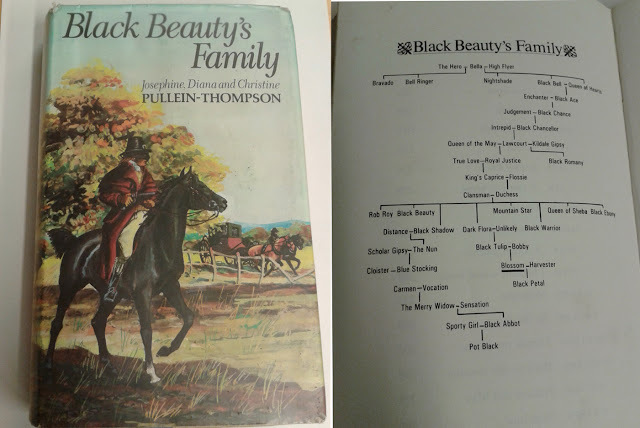 This copy of Black Beauty’s Family is to be found in the ‘Warwickshire Libraries Award Winning children's books’ Collection, which was donated to Seven Stories in 1997. This collection is made up of 260 books published between 1936 and 1996, predominantly past winners of the Carnegie and Kate Greenaway medals. This book won neither of these awards, although Josephine Pullein-Thompson was awarded the Golden PEN (Poets, Essayists and Novelists) Award in 2007 for "a Lifetime's Distinguished Service to Literature” and was appointed MBE in 1984. We haven't yet been able to ascertain which award Black Beauty’s Family might have won - if any - and thus why it appears in this ‘Award Winning’ collection! Can you help? We hold a couple of other ‘prize winning’ book collections which you might like to find out more about: Vera Coleman’s ‘Modern Picture Book Collection: award winners and their books’; and our own collection of Carnegie and Kate Greenaway medal shortlisted titles 2006-date. If you want to find out more about Seven Stories shadowing of the awards, and our holdings of Carnegie and Kate Greenaway medal winners, click here. Manuscript for The Little Wooden Horse, by Ursula Moray Williams, (G.G. Harrap & Co., 1937), shown alongside a 1959 Puffin edition of the book. This small wooden toy represents one of the oldest books represented in the Seven Stories archive, as our collecting period runs from the 1930s to the present day. It is also one of the earlier pieces donated, given to us by the creator, Ursula John (nee Moray Williams), in July 2005, just before Seven Stories opened its doors as a visitor centre. This amazingly legible manuscript follows through the whole story, and is complemented in the archive by the later typescript, a further version of the story which was sent to the publisher. The manuscript does contain occasional notations and crossings out, but, as seen above, these are relatively few. The story follows the little wooden horse on many adventures - gathering pirate treasure, working in a coal mine, walking a tightrope in the circus, and other such adventures you can imagine a toy might have! Throughout the book, the little horse longs to return to his maker, Uncle Peder, whom he wished never to leave. The Ursula Moray Williams Collection represents her long career, from the 1930s to the 1990s. 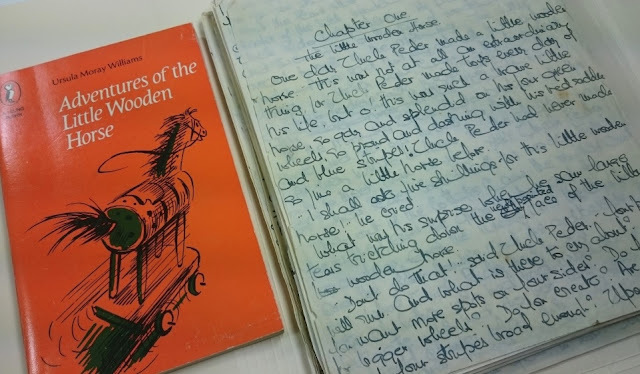 It contains manuscripts, typescripts and related draft material for 36 of her published works, as well as original artwork relating to nine of her published books (including Gobbolino the Witches Cat, and unpublished sketches for The Further Adventures of Gobbolino and the Little Wooden Horse). The archive also contains personal and professional correspondence spanning Williams' career as a children's author, including correspondence from family and friends, fans, schoolchildren, publishing houses, professional organisations, literary agents, other children's authors, illustrators, and others active in the field of children's literature; and a small quantity of personal papers which includes royalty statements, press cuttings and reviews, notes for articles and talks, and book jackets. That is it for this year, if you have you missed any of our All About Animal blog posts, click here to find them all together for your reading pleasure!